Celiac Disease Awareness Day takes place in the United States this year on September 13, 2012. On a day when we honor those with the disease, Vidazorb® chewable probiotics wants celiac sufferers to know that relief may be well within reach. It is important for consumers to know that probiotics may provide the restorative balance their digestive system needs. The University of Chicago’s Celiac Center reports that one out of every 133 Americans suffers from the digestive disorder, yet this number is probably higher due to the fact that it is a difficult disease to diagnose. With such a large number of people suffering from celiac disease, many will benefit by learning about probiotics. Celiac disease is an abnormal digestive condition triggered by the protein gluten. When people with celiac disease eat foods that contain gluten (proteins found in certain grains such as wheat, rye and barley), their immune system responds with a toxic reaction that causes chronic inflammation and damages the small intestine. This reaction blocks nutrient absorption so no matter how many nutrients enter the body, too few are utilized, leading to malnourishment. Other effects of celiac disease include episodes of depression and anxiety as well as a high level of gut barrier permeability, which allows harmful bacteria into the digestive system at a higher rate. The key to returning the body to optimal health after a celiac disease diagnosis is to find a way to absorb necessary nutrients so that the small intestine can work to repair itself. Regular use of effective probiotic supplements like Vidazorb® can aid in immediate improvement as well as ongoing nutrient absorption. Repairing the gut takes time and, along with a probiotic regimen, those with celiac disease need to adhere to a gluten free diet for the rest of their lives. Probiotics are defined as live microorganisms which, when consumed in adequate amounts, provide a health benefit to the host. The main job of these beneficial bacteria is to help digest and absorb nutrients as food particles pass through the gastrointestinal tract (GIT). The GIT contains both good and bad bacteria, and while achieving a positive bacterial balance is important for everyone, it is especially helpful in managing celiac disease on a daily basis. I don’t suffer from Celiac Disease, although stress trigger’s IBS symptoms for me. Taking a Vidazorb® Supplement every day helps eliveviate my IBS flare ups. Researchers don’t know excactly why probiotics help IBS sufferers like myself, but some studies suggest that probiotics, especially those with a predominance of Bifidobacterium infantis, alleviate IBS symptoms like abdominal pain, bloating, and bowel movement irregularity. 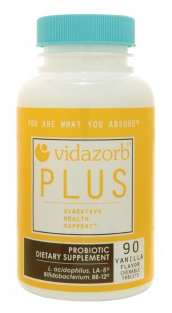 If you suffer from Celiac Disease or any other digestive track diesease or disorder I recommend taking Vidazorb® every day to help your digestive track run smoothly. Vidazorb® probiotics can be purchased online at bestprobioticsonline.com. *Disclosure: I received a bottle of Vidazorb® Plus Probiotic in exchange for this review. All opinions are accurate and 100% mine. Ms. Talbert is a featured health blogger at Wellsphere.com and her articles can also be found on ezinearticles.com. She also runs the Healthy Moms Social Network on Ning, is the Chief Marketing Officer for Talbert Nutrition LLC, and is on the Social Media Advisory Board for America’s Wellness Challenge. Follow her on Google+. Want Longer Life? Speed Up Your Gait!